I'm starting off my Coffee Party with The Coffee Bump! You have to visit The Coffee Bump! You will find an unlimited selection of all things coffee. Their ABOUT US states this about their site that it includes " whole coffee beans, coffee grinders, coffee mugs, coffee makers and espresso machines, coffee tables, and unique coffee wall art. I have to warn you that this is not just your average coffee purchasing site, but instead, we focus on taking an alternative approach to how you enjoy your brew by customizing and selecting the coffee products and tools that are specifically right for YOU. So, if you are an individual who wants more from your daily cup of joe, please enjoy this site with all the products and resources we have to offer you." I totally agree with their ABOUT US! Very fun and easy to use site. How many CEO's do you know with the name, Chuggin McCoffee? I just giggle saying his name. *You will find The Coffee Buzz: a newsletter that gives you tips and guides about coffee based on your preselected style and roast! *While there take The Java Questionnaire to find out what suits your taste and what products they have for you. I took the quiz and found out what suits me! *How abut The Coffee Sommelier? Ever heard of it? I had not! You give them your wine preference and then get a recommendation back on a coffee roast to pair with it!!! How FUN! Guess what? Still more fun to be found! You can get a customized coffee/wine ID that personalizes your choice of mug! *Check out Chuggin McCoffe! 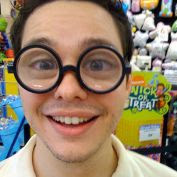 He has his own Hubpage! Sweet!!! *Do yourself a flavor/favor and check out the BLOG too! 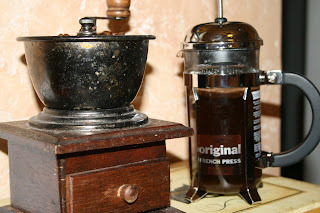 His latest post is How to Clean your Coffee Grinder. Still need more Chuggin McCoffe? The tweet with him at ChugginMcCoffee! I was sent The Bodum Chambord 3 Cup Coffee Press to review! When I opened the box, my first thought was "ahhhhhh soooo freaking cute!" After playing with it and several uses I still thought that it was so freaking cute, easy to take on vacations and this little girl kicks out an awesome cup of coffee! Description from The Coffee Bump: Almond Toffee Flavored Coffee is made of premium Arabica beans infused with toasted almond oil that you can savor. The blend is also full of caramel notes which bring out intense aromas of sugar, butter, and vanilla. The final touches to the complex and delicious tastes of Almond Toffee Flavored Coffee is the sweetness of butterscotch that give a smooth finish to this fine blend. Toffee is a treat that hails from England where molasses was boiled with butter and cream for a flavor that we still love today, and it is even better enjoyed as a steaming cup of coffee. A dessert in your mug! BONUS ENTRIES (do one, all, none, up to you! Better your chances to get "a dessert in your mug". Make a separate comment for each entry. 8- Leave a comment on any COFFEE POST from Aug 1st-15 and come back here and tell me which one you did for 1 extra entry every time. GOOD LUCK! ALL GIVEAWAYS FOR COFFEE WEEK ENDS AUG 16th!!! I"M FIRST to enter!!!! yooohooo I love the mug idea. I want one for my dad! I"ll do more later but i'm your friend on twitter! Well! Can I tell you how happy I was to have seen you comment on my sister's Facebook status telling her about this giveaway! We l-o-v-e coffee! Anyhoo - We also love using French presses. We made the switch a few years ago and haven't looked back since. Though, I would like to get a grinder that is better suited for presses. Like their "EG&H Hand Cranked Coffee Grinder" -- I like that you can adjust the coarseness accordingly! Very cool. Artsy thanks for entering!! I want one of those mugs tooo!!!! Erin! Thanks for entering! Add me on FB! I too like that Grinder! Once you use a grinder like this you never go back to that quick push kind! Enter your Blog on the Linky above toooo!!!! Thanks! I added your button under FUN BLOG ROLL!!! Thanks for entering Erica! Looks like people need coffee grinders!!! Good luck!! I want the Chambord 8 Cup French Press Gold. Sooooo elegant!! I would love to purchase the "Cuisinart Grinds and Breqa Coffee Maker" for my sister and her husband's 45th wedding anniversary! I would get a 3 cup French Press for my friend who needs a new coffeemaker. Would be a great birthday present for my Mom. 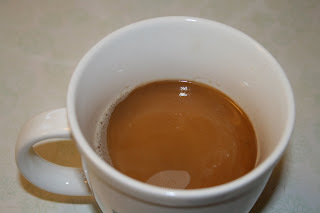 Almond Toffee Coffee Giveaway :: http://good.ly/cbl6l6 :: RT Daily Ends August 16th!!! Hi, I read the following article on their blog: http://www.thecoffeebump.com/blog/2009/08/have-you-considered-coffee-wedding.html. My friend's son just became engaged and what a wonderful idea to use coffee as favors. I would love to get the baklava flavored coffee!MMMM that just sounds so yummy! I love the Elephant French Coffee Art Canvas! Thanks for the chance to win. I also commented on the Country Hearts giveaway. I would love to have the Cuisinart Grind and Brew Coffee Maker! Very cool! Thanks for the yummy giveaway! I follow ChugginMcCoffee on twitter! I commented on coffee tart giveaway 24 times! Does that mean I get 24 more entries to this one? I'm sorry, I'm confused. Thx for all your entries!! You get 1 extra entry per each giveaway you entered. So if you entered the Tarts then you post here that you entered the Tarts giveway. So if you enter every giveaway I am offering then you get to get 1 entry per each actual giveaway!!! Sweet! Good luck! I love flavored coffee, so I would love to try the Banana Hazelnut flavored coffee. I would buy the Cuisinart Grind and Brew Coffee Maker for my mom as a gift. She is a flavored coffee nut! I have added both my blogs to your linky. and the other at the 3 Bars of Soap give away. Contest has ended! Off to Random.org to pick the winner!!! Congrats to ERIN! She is the winner of this giveaway! Please all support the sponsor! They are a great company!!! !